The Matter of Britain is the body of medieval literature and legendary material associated with Great Britain, and sometimes Brittany, and the legendary kings and heroes associated with it, particularly King Arthur. 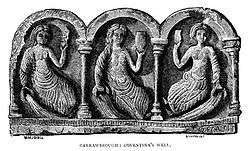 It was one of the three great literary cycles recalled repeatedly in medieval literature, together with the Matter of France, which concerned the legends of Charlemagne, and the Matter of Rome, which included material derived from or inspired by classical mythology. That of France, of Britain, and of great Rome. It could be said that the legendary history of Britain was created in part to form a body of patriotic myth for the country. Several agendas thus can be seen in this body of literature. The Historia Britonum, the earliest known source of the story of Brutus of Britain, may have been devised to create a distinguished genealogy for a number of Welsh princes in the 9th century. Traditionally attributed to Nennius, its actual compiler is unknown; it exists in several recensions. This tale went on to achieve greater currency because its inventor linked Brutus to the diaspora of heroes that followed the Trojan War, and thus provided raw material which later mythographers such as Geoffrey of Monmouth, Michael Drayton, and John Milton could draw upon, linking the settlement of Britain to the heroic age of Greek literature, for their several and diverse literary purposes. As such, this material could be used for patriotic mythmaking just as Virgil linked the mythical founding of Rome to the Trojan War in The Æneid. Geoffrey of Monmouth also introduced the fanciful claim that the Trinovantes, reported by Tacitus as dwelling in the area of London, had a name he interpreted as Troi-novant, "New Troy". More speculative claims link Welsh mythology with several of the rulers and incidents compiled by Geoffrey of Monmouth in his Historia Regum Britanniæ. It has been suggested, for instance, that Leir of Britain, who later became Shakespeare's King Lear, was originally the Welsh sea-god Llŷr (see also the Irish sea-god Lir). Various Celtic deities have been identified with characters from Arthurian literature as well: Morgan le Fay was often thought to have originally been the Welsh goddess Modron (cf. the Irish goddess Mórrígan). Many of these identifications come from the speculative comparative religion of the late 19th century, and have been questioned in more recent years. William Shakespeare was interested in the legendary history of Britain, and was familiar with some of its more obscure byways. Shakespeare's plays contain several tales relating to these legendary kings, such as King Lear and Cymbeline. It has been suggested that Shakespeare's Welsh schoolmaster Thomas Jenkins introduced him to this material, and perhaps directed him to read Geoffrey of Monmouth. These tales also figure in Raphael Holinshed's The Chronicles of England, Scotland, and Ireland, which also appears in Shakespeare's sources for Macbeth. Other early authors also drew from the early Arthurian and pseudo-historical sources of the Matter of Britain. The Scots, for instance, formulated a mythical history in the Picts and the Dál Riata royal lines. While they do eventually become factual lines, unlike those of Geoffrey, their origins are vague and often incorporate both aspects of mythical British history and mythical Irish history. The story of Gabhran especially incorporates elements of both those histories. The Arthurian literary cycle is the best known part of the Matter of Britain. It has succeeded largely because it tells two interlocking stories that have intrigued many later authors. One concerns Camelot, usually envisioned as a doomed utopia of chivalric virtue, undone by the fatal flaws of Arthur and Sir Lancelot. The other concerns the quests of the various knights to achieve the Holy Grail; some succeed (Galahad, Percival), and others fail (Lancelot). The medieval tale of Arthur and his knights is full of Christian themes; those themes involve the destruction of human plans for virtue by the moral failures of their characters, and the quest for an important Christian relic. Finally, the relationships between the characters invited treatment in the tradition of courtly love, such as Lancelot and Guinevere, or Tristan and Iseult. In more recent years, the trend has been to attempt to link the tales of King Arthur and his knights with Celtic mythology, usually in highly romanticized, early 20th century reconstructed versions. The work of Jessie L. Weston, in particular From Ritual to Romance, traced Arthurian imagery through Christianity to roots in early nature worship and vegetation rites, though this interpretation is no longer fashionable. Additionally, it is possible to read the Arthurian literature in general, and that concerned with the Grail tradition in particular, as an allegory of human development and spiritual growth (a theme explored by mythologist Joseph Campbell amongst others).